The news of Make up For Ever’s unretouched ad – a first for the beauty world, apparently – has been flying around the world wide web today. I was excited to hear the news – I think it is a genius idea, and frankly I wish I had thought of it myself. This isn’t because I believe that the product the advert is promoting – an HD Invisible Cover Foundation range – must be fantastic because the girl looks so flawless. Let’s face it; the model’s skin looks pretty flawless even if she didn’t have a scrap of make up on. No, I think it is fantastic because by taking the unprecedented step of sending an unretouched ad to press (and then sending out a press release about it), French brand Make Up For Ever has succeeded in getting talked about worldwide across mainstream press (I picked up on it on the Daily Mail earlier), beauty blogs, twitter... etc, etc. 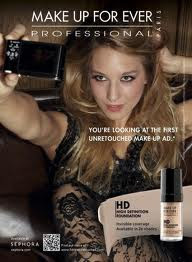 And because the new HD foundation range fits in so nicely with the message that having an unretouched ad promotes (i.e. the product is so good, we don’t need to fake the results), the HD Foundation is being talked about synonymously within the hype – nicely earning the type of worldwide press and hype that is many a PR’s dream. Good work, Make Up For Ever marketing team! It will be interesting to see how other brands react – will they follow suit? Will it make a difference? Dove’s infamous Real Women campaign did a fantastic job in making the brand stand out from its competitors and generating sales, but the use of conventional models within beauty advertising is still mainstream – so in this aspect it didn’t turn the industry on its head. Regardless, what I find refreshing about Make Up For Ever’s clever move is that is gives the brand an air of honesty – even though the model does have flawless skin, at least we can see it is her skin. It drives me mad when mascara ads use lash inserts within their advertising – frankly it tells me that the brands don’t believe in their own mascara and I think it does a fine job of promoting false eyelashes instead! What do you think about Make Up For Ever’s unretouched ad? Thanks Holly, it will be interesting to see whether or not the ad has in actual fact been retouched or not - it would be a bold (stupid) move to make such a public statement about something that isn't true.